In the Japanese version, Hikora calls his sister "Imoto" which is the Japanese word for "younger sister". So it is guessed Sorincha is Hikora's younger sister. Sorincha went to play the game of O-to-ko-yo and did not return. She appears to be possessed by a demon, since at the end of the movie her mask changes to that of a demons... the "Fifth Demon" in the city. 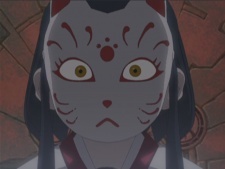 It is possessed that the night before she was the last kid left and didn't get caught, and the possessed mask was put on her, making her "it" for the next game. It is unknown what happened to Sorincha at the end of the game, she is not shown at the end.